As our economy becomes increasingly reliant on digital technologies, the problems of power outages and associated costs are becoming more severe. Interruptions in electricity delivery, whether from natural or man-made disasters, or increased grid congestion, cost consumers billions of dollars every year and jeopardize the well-being of Americans and U.S. industry. However, new technologies and government partnerships are helping to modernize the electric grid, which will enhance the security and reliability of our nation's energy infrastructure. 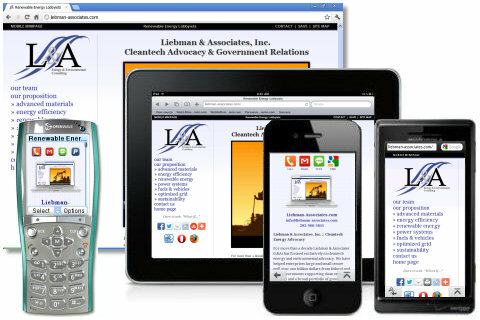 Liebman & Associates (L&A) can help you develop the right partnerships with government and industry to capitalize on the resources and technologies that are available for your business. The limited ability of the electric grid to respond rapidly to disturbances makes it vulnerable to a greater number of outages that can spread quickly and have regional effects. But new "smart grid" technologies, including sensors, control systems and two-way communications networks, can provide real-time information to grid operators about the power flows across the transmission and distribution (T&D) system and enable greater use of demand response, energy storage, advanced metering infrastructure and other peak load reducing strategies. These same smart grid systems, along with power electronics devices such as switches and inverters, make it easier and more cost-effective to integrate renewable energy and distributed generation technologies with the electric grid in a safe and reliable manner. Energy efficient buildings, appliances and equipment also benefit the modern electric grid. Smart meters and appliances, conveying price and congestion information received from the utility, can automatically prompt consumers and their end-use equipment to use less energy at a specific time, thereby relieving stress on the grid. Electric vehicles, including plug-in hybrid electric vehicles (PHEV), depend upon an electric distribution system that can provide cost-effective charging to the consumer while easily dispatching energy back to the grid if needed. Commercial and industrial electricity consumers can leverage these technologies and government support to increase the reliability of their operations while reducing electricity costs. Utilities can improve reliability and address growing demand by leveraging these resources to increase operational speed and efficiency. All companies can benefit from the greater reliability and security afforded by these technologies. Ask L&A to show you how.